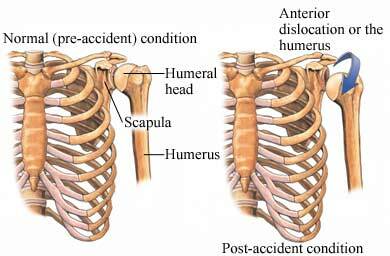 Glenohumeral dislocations are generally classified by the direction of dislocation of the humerus. Shoulder dislocations can also be associated with fractures—one can have a fracture and dislocation at the same time. Nerves and blood vessels can sometimes be injured with a severe shoulder dislocation, requiring immediate medical attention. You will be asked about your symptoms and how the injury occurred, and will examine the injured area. Diagnosis is also based on the physical exam of your shoulder area. The doctor may do an x-ray to rule out a related fracture or damaged surrounding soft tissue and to see which direction the shoulder is dislocated. Seek medical care right away. Do not try to put your shoulder bones back into place. If you wait for treatment, you could cause permanent damage. The doctor will move the head of the humerus back into the shoulder joint socket by applying traction to your arm. You will be given pain medication before this procedure begins. After the reduction, you will need to wear a sling or a device called a shoulder immobilizer to keep the shoulder from moving. The shoulder is generally immobilized for about 4 weeks, and full recovery takes several months. Surgery is rarely needed for a first time dislocation. It is often needed for a shoulder that dislocates repeatedly. It is important to rest your shoulder and not put any strain on the joint area. This will require a reduction in activities while your shoulder heals. However, complete rest is rarely required. Ice and elevating your arm at rest may also be advised to help with discomfort and swelling. Ask your doctor when you can switch from ice to heat. As you recover, you may be referred to physical therapy or rehabilitation to start range-of-motion and strengthening exercises. Do not return to activities or sports until your doctor gives you permission to do so. Your doctor may advise nonsteroidal anti-inflammatory drugs (NSAIDs) to help relieve inflammation and pain. Dislocated shoulder. American Academy of Orthopaedic Surgeons Ortho Info website. Available at: http://orthoinfo.aaos.org/topic.cfm?topic=A00035. Updated October 2007. Accessed December 17, 2014. Quillen DM, Wuchner M, Hatch RL. Acute shoulder injuries. Am Fam Physician. 2004;15;70:1947-1954. Shoulder dislocation. EBSCO DynaMed Plus website. Available at: http://www.dynamed.com/topics/dmp~AN~T115848/Shoulder-dislocation . Updated October 2007. Accessed November 13, 2017. Shoulder problems. National Institute of Arthritis and Musculoskeletal and Skin Diseases website. Available at: http://www.niams.nih.gov/Health%5FInfo/Shoulder%5FProblems/default.asp. Accessed November 13, 2017.